As much as it’s nice to fantasize about that sweet moment where you hand in your final final, it’s important to realize that we’re not quite there just yet. However, it’s now time for a short but well-deserved break. Thanksgiving is just around the corner and this means that you have a prime opportunity to catch up on schoolwork and, more importantly, rest and relax before the final push of the semester. Whether you’re departing from the Hickory Mills, Summit Hill, or Whitehall Terrace apartments, Kent’s Best Apartments cares about your success as a Kent State University student. 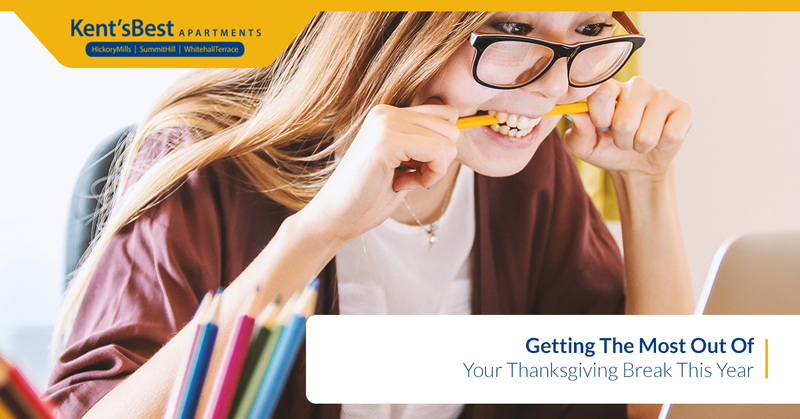 Visit our main blog archive for more helpful resources, check out this blog for some Thanksgiving break insight, or read on for more tips to get the most out of this much-needed upcoming break. Let’s get started. It’s easy to think that you’ll get everything done that’s on your plate. However, it’s important to be realistic, here — can you really fully study for any upcoming exams, complete all of your homework assignments, coordinate with classmates on group projects, email professors back and forth, catch up with old friends back home, spend time with your family members, and find the time to somehow rest and relax? If you’re trying to get many things done, communicate with your family ahead of time that you have a lot to do during break. We’re sure they’ll understand, though we encourage you to take this time to simply hang out and enjoy each other’s company! This is a good general studying tip, but a great way to lock in academic motivation is to start tackling the smaller, easier items on your plate to give you a genuine sense of accomplishment. Go ahead and knock out a couple online quizzes while your clothes are in the washer, and fill out your own exam cheat sheet before you head out to the grocery store with your mom. The more things you do, the better you’ll feel about your progress. If you enjoyed your time eating and catching up with your friends and family, don’t try to make up for your lack of productivity in one night. The idea behind this break is just that — to take a well-deserved brain break from school, and also to see the people that you love in your life, but don’t get to see often enough. So, we’re not encouraging the residents of our Kent apartments to blow off their schoolwork, we’re simply saying that it’s just fine to let go and enjoy your time. There’s no sense cramming in schoolwork at the end of the long weekend when you can return to Kent and focus with a rested and relaxed mind, right? Need us to help you prepare for break, or provide custom accommodations for the last few weeks of the semester? Kent’s Best Apartments is here for you. Reach out today.